As a group complete the activity assigned to your group. Discuss and explicate the key points from your discussion and post as a group entry. Based on the previous discussion on cyber issues ... 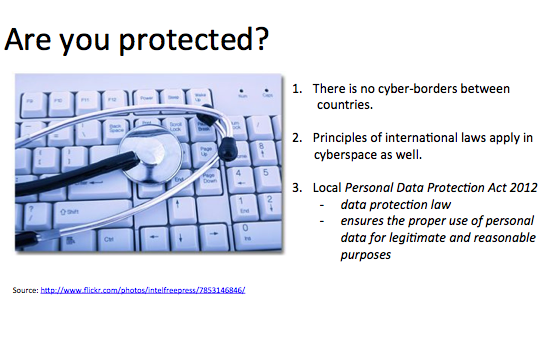 Suggest strategies on how would you protect yourself in the cyberspace from these motives? (1) why is the cause of the crime? (2) what could be done to prevent the crimes from happening? (1) what is the cause of the crime? Identify at least 3 rules that we could enforce in S104 to protect ourselves in cyberspace. Nehal, Myat Noe, Sean, Taufiq, Bryan Lee, Kenric. 1. We can don't reveal too much too much of our personal information online like our address etc. 2. On social networks, like Twitter and Facebook, we can "friend" and follow the people with more than a certain number of mutual friends or people you personally know. Ans: She might have posted personal information about herself as a primary school teacher and pictures of her students which led to the stalker harassing her. Ans: She could have been more vigilant and not post her personal information online. She also should have not given the school her personal email. 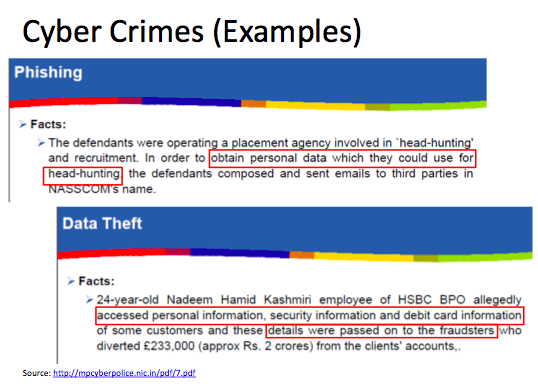 For the case of Phishing, the victims were too trusting, and believed that the defendants were really from NASSCOM, and did not doubt the email sent to them. For the case of data theft, the employee was probably greedy for money, and gave the information to the fraudsters. For the case of Phishing, we should be more vigilant, and maybe call NASSCOM to confirm anout the email. For the case of data theft, banks can conduct checks once a month or something. Hi all - thanks for being such captive participants in this programme. TRUST, VIGILANT, SAFETY AND SELF PROTECTION. Great work and have a great weekend.